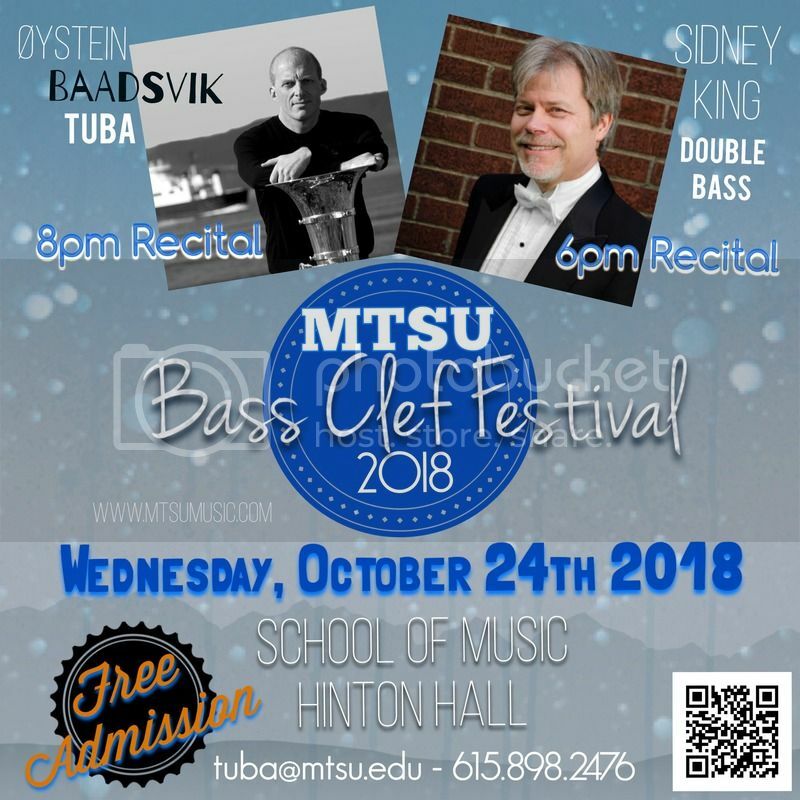 We’re looking forward to hosting Øystein Baadsvik (8pm tuba recital) and Sidney King (6pm double bass recital) at Middle Tennessee State University for our first MTSU Bass Clef Festival on Wednesday, October 24th 2018 at the MTSU School of Music, 1439 Faulkinberry Dr., Murfreesboro TN - Free admission! Contact tuba[at]mtsu[dot]edu for more information, thanks! Now this is a recital i may make a trip to come and see, how did you hook these guys up? If you live anywhere near this event, do attend! Baadsvik is something special. The videos are on YouTube and I imagine he would sound much better in person. mctuba1 wrote: Now this is a recital i may make a trip to come and see, how did you hook these guys up? The Planets aligned. You’re welcome to make the trip, Nashville is a great destination city. Lots to see and do for everyone! Bump. This event is next week if anyone is inclined to make the trip. Sent him off from Grand Rapids this morning. What a delight. I wrote up a how-to and put it on the TubaEuph Yahoo group.